gift basket, gift basket, gift basket, gift basket shipped. Size 18" X 18" X 20"
Decorated in a Luxurious Garden Setting suitable for someone who enjoys being pampered. 2CheckOut.com Inc. (Ohio, USA) is an authorized retailer for goods and services provided by Royal Gift Basket Corp.. You will use the secure processing for your payment when you click the 2CO CheckOut Button that says "Buy This Item". Shipping charges are calculated for delivery within the Continental USA. Please contact us for international sales and delivery options. Size 18" X 18" X 15"
Scroll down to view a variety of highly themed gift baskets, made beautifully to match all kinds of themes and occasions. 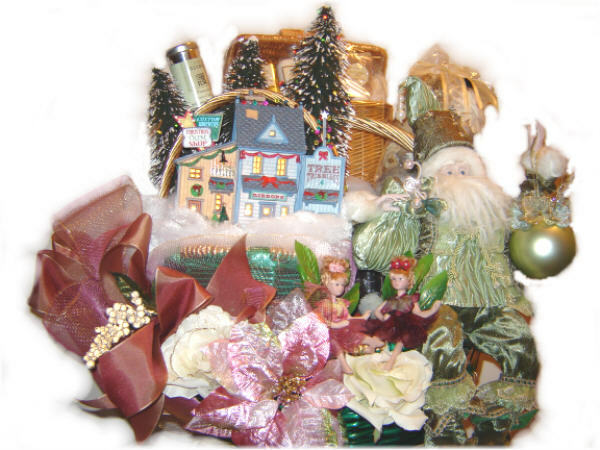 A Royal Gift Basket is a very creative arrangement, most of which feature a scene or theme such as a miniature winter wonderland, a seaside or beach scene, or a miniature flower garden or landscape made by hand. The scene itself makes the gift basket useful even after the spa items and snacks are used up, it is still a thing to remember forever. You may also contact us to request a special theme made just for your recipient. See our MENU of designs and themes to choose from or scroll down this page to view all . PLEASE NOTE: The photos here do not show all the food, snack, gift or spa items that are included. The decor and design is featured here which is the highlight of the baskets. ALL of our baskets are filled and brimming with food or snack, spa and gift items when finished. If there is anything in particular that you would like included in the basket, we will do our best to comply with your request. Please email your request. 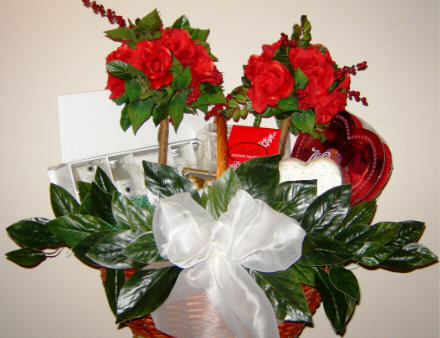 We email you pictures of the finished basket upon completion of the design for your approval prior to shipment. See our client comments/photo page. Royal Romance Gift Basket is a delicately arranged creation, wrapped in tulle and topped with silk roses, containing a designer scents, a collection of body, bath and beauty products, including lotion, oil, bath splash, soaps, potpourri, candles, and accessories. Every Royal Gift Basket comes with a complimentary gift card. Order below. What else is in the basket? Royal Valentine Garden Gift Basket is a special creation for special people, containing a heart shaped box of delicious chocolate and truffles, designer collections of body, bath and beauty products including body lotion, shower gel, after bath oils, bath splash, bath crystals, bath salts, fine soaps, relaxation candles, and accessories such as a cosmetic bag or jewelry box. It is highlighted with 2 topiary trees of red roses and silk magnolia leaves. Please note**If it is not Valentine's Season we will make this romantic basket without a red Valentine chocolate box, using other delicious seasonal chocolates to substitute. What else is in the basket? All gift baskets have items that are luxurious. Each basket is beautifully decorated and bountiful in contents, topped with silk greenery and floral foliage and wrapped in tulle mesh fabric or clear cellophane. Every Royal Gift Basket comes with a complimentary gift card. Order below. Set in a decorative pearlized artificial clam shell suitable for a special lady. She can relax and enjoy the soothing spa items contained in this basket. It is beautiful to look at and the spa products will give great pleasure. It contains collections of designer spa and bath products, bathing milk to soften skin, body lotion, exotic bath crystals, bath gel and bath splash, aromatherapy scented candles, body sea sponge, incense and potpourri. If she uses the items, she can re-fill it again replacing the items with her own and use the arrangement as a display. What else is in the basket? Set in a large 20inch pearlized clam shell-shaped container that can be used in a home bath or spa area to create a luxurious ambiance. 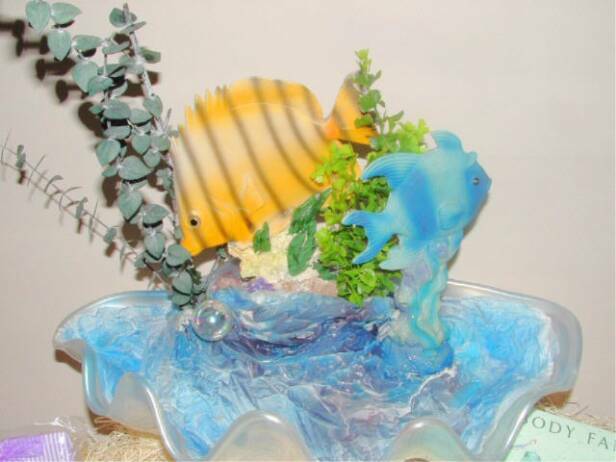 The arrangement comes complete with ceramic fish and foliage and natural eucalyptus sprigs to add a wonderful fragrance. It is wrapped in cellophane and topped with a bow. Every Royal Gift Basket comes with a complimentary gift card. Order below. 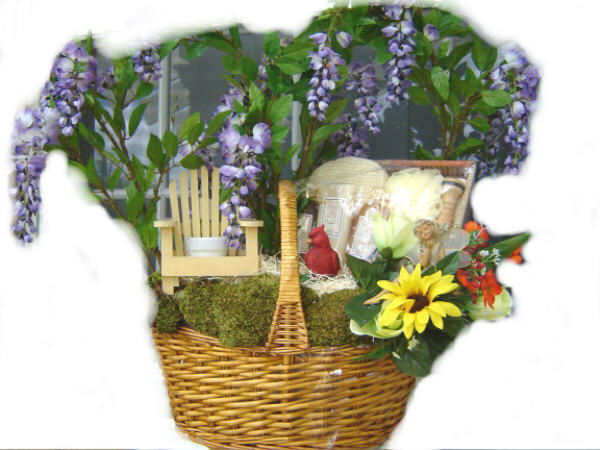 Make someone happy with a charming fairyland garden gift basket. 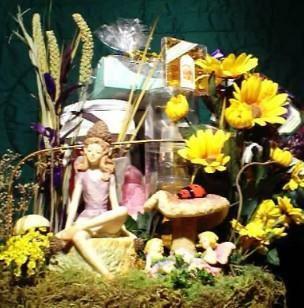 This very large, creative gift basket features a fairy in her favorite garden. There is also another version with Two Pixie Fairies in their garden. 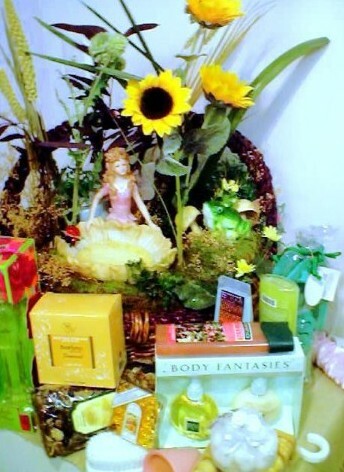 The fairy garden itself can be used to decorate a special spot in any home or other place even after the spa or gourmet products are used up. Designed to perfection to reflect any season. See below for our Royal Fairyland Christmas Gift Basket Design. What else is in the basket? 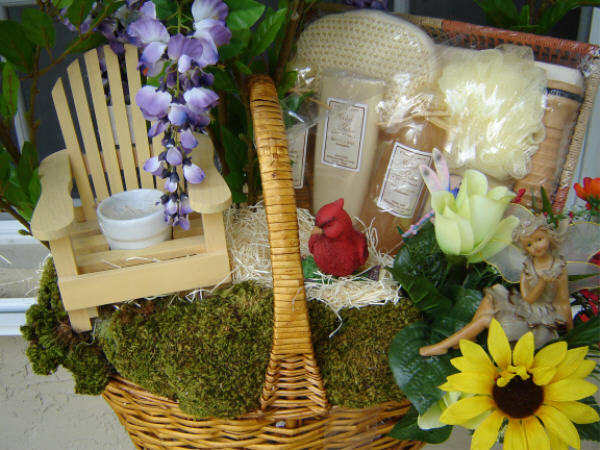 The basket contains a beautiful fairyland garden scene that is so amazing, the products in the basket are just the icing on the cake so to speak. This arrangement would be most appreciated by a special lady who is herself creative and imaginative and who likes beautiful things. Items include spa products to promote relaxation, beauty and well being. Bath and body collections of fine soaps, bath fizz bombs, bath crystals, anti-stress bath soak with chamomile and vitamin E, anti-tress revitalizing peel-off face masque, bath gel, after bath splash and body lotion, wooden body massager and massage lotion. It also contains a bath brush, bath sponge, bath mitten, votive candles and a one pound bag of delicately scented potpourri. You may indicate a preference of scent for candle etc., for example vanilla, strawberry, etc. in an email to us. It is wrapped in clear cellophane and crowned with an elegant bow topping. Every Royal Gift Basket comes with a complimentary gift card. Order below. 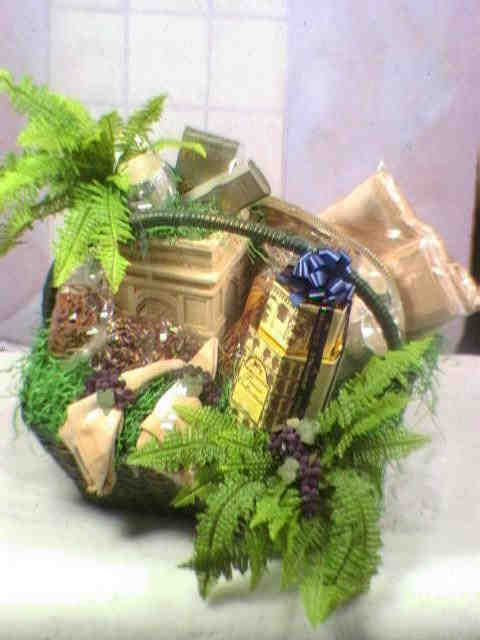 Royal Garden Gift Basket is an elegant creation, decorated like a miniature garden scene. Click below for a variety of scenes we have created. Every scene is unique using items such as a birdhouse, bench, miniature flowers, figurines of deer, frogs, ducks, and creatures such as lady bugs, butterflies, etc., also figurines of little people may be included. This arrangement is designed to relax and sooth. It contains a collection of body, bath and beauty products, designer perfume, lotion, oils, bath splash, crystals, salts, milk bath, soaps, potpourri, candles and accessories such as scented drawer liner papers. If you would like to customize one of these baskets please contact us by email and let us know what items you think would better suit your recipient or occasion. What else is in the basket? A complimentary gift card is included with your basket. Elegantly designed with gourmet food gift treats and dining accessories. Size 18 inches wide X 20 inches high. 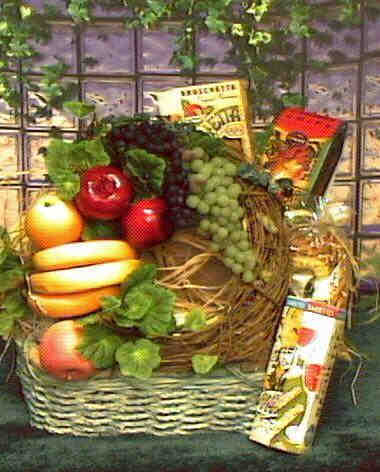 Royal Gourmet Gift Basket perfect for any occasion. Not just another Gourmet Food Basket. This presentation contains a collection of Gourmet Food Gifts including, pretzels, jelly beans, parmesian bits, butter cookies, rocky road popcorn and cinnamon stirs. In addition the gourmet basket has a gift box that contains Italian specialty cake, fine gourmet coffee and gourmet candy. The accessories include a Silver Tray, table cloth, vase with silk fern plants. It's like setting table. What else is in the basket? We reserve the right to include accessories and gift items of equal or greater value. Some items are seasonal and are included when available. Royal Centerpiece in a Gourmet Gift Basket is the best description for this basket. It features an assortment of delicious, food gifts and tasty snacks. The highlight is a beautiful table centerpiece decorated with artificial fruit and foliage on a 18 inch grapevine twig wreath. The centerpiece/wreath may be used as a wall hanging or to decorate a table. Gourmet food gifts include Specialty Popcorn, Delicious Cookies, Specialty Pretzels, (such as sourdough, Tomato Basil, Butter Toffee or Chocolate covered), Specialty Honey Roasted Nuts, Jelly Beans, Gourmet Chocolate and Truffles. Also included are a package of Coffee, Cafe, and a pair of Wine or Water Goblets OR a one pound bag of deliciously scented potpourri. The goblets are accessories that are based on availability and may be substituted with items of greater or equal value. What else is in the basket? 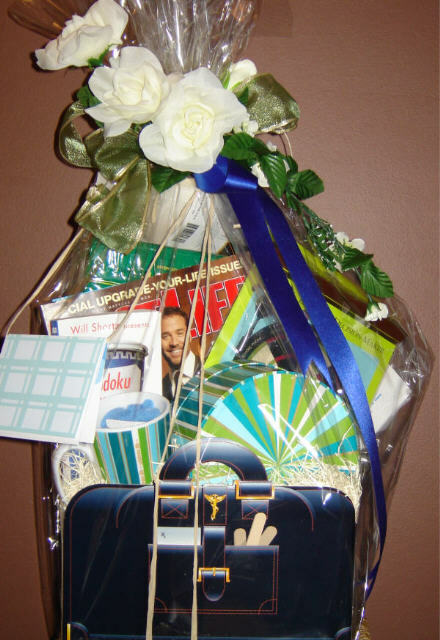 Royal Doctors Orders Gift Basket features a gift box or basket filled with get well treats to help in healing and spiritual wellness. Items include playing cards, reading material such as crossword puzzles and word games, reader's favorite magazines, lozenges and throat drops, stone wheat crackers, herbal tea, healthy recipe book and chicken soup. We reserve the right to include accessories and gift items of equal or greater value. A complimentary gift card is included with your basket. What else is in the basket? Basket Measurement 15" X 18" X 20"
Click the Buy Button Below to Purchase . 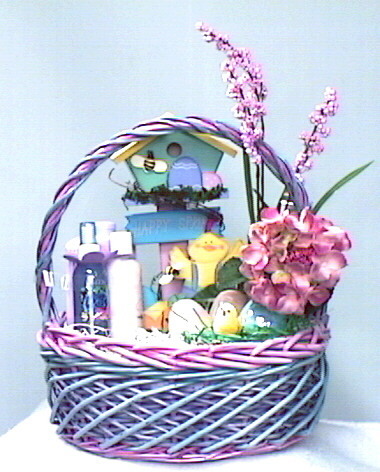 Celebrate Easter with a loved one or friend by sending a beautiful basket arrangement. This basket contains a collection of body lotion, shower gel, fine soap, body creme, and a scented candle, chocolate eggs and candy. What else is in the basket? It is decorated just as it appears in this photo, which includes a springtime wooden tabletop or hanging decoration for the home and silk flowers in a beautiful wicker basket, wrapped in cellophane and topped with a bountiful bow. Great for Easter or Spring. A complimentary gift card is included with your basket. 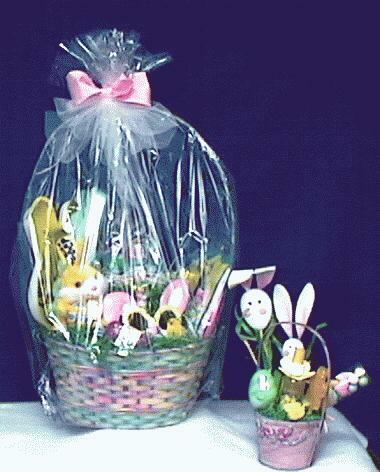 Basket Measurement 12" X 15" X 20"
Celebrate the Easter with your favorite kids. Contains an assortment of toys and games suitable for ages 3-7, that include a variety of dolls, dolls clothes, toy cars, trucks, bikes, bunny rabbits, play dough, crayon sets, coloring kits, kiddie jigsaw puzzles, story books, fun kids shampoo , chalk and chalk board, paddle racquet, ball and a variety of other items. Chocolate easter eggs and other candy included in every basket unless otherwise instructed. A complimentary gift card is included with your basket. IMPORTANT! Please tell us whether the recipient is a boy or girl and their age as well as any message you would like to express to the recipient .... Please use the form below. 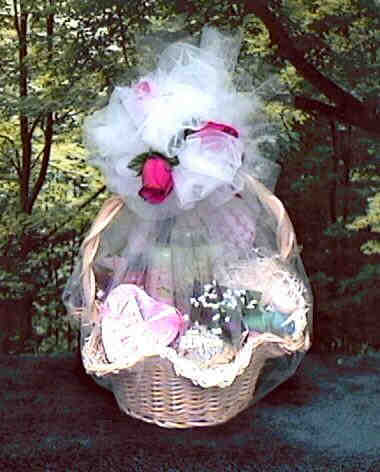 Royal Baby Gift Basket perfect for Baby Showers filled with items for newborn baby girls or boys. Comes in a gift box shaped like a baby's crib or in a beautiful gift basket and includes a small wicker baby carriage with a plush toy. Highly themed to include various famous children's cartoon characters, this gift arrangement includes, toys for the baby, socks, bottle washer, newborn plastic fork and spoon set, baby soother, bibs, bath and layette set and photo album for baby. If you know whether the baby will be a Boy or Girl please specify so that we can customize the basket colors to suit the gender. Please use the form below to tell us more. What else is in the basket? A complimentary gift card is included with your basket. 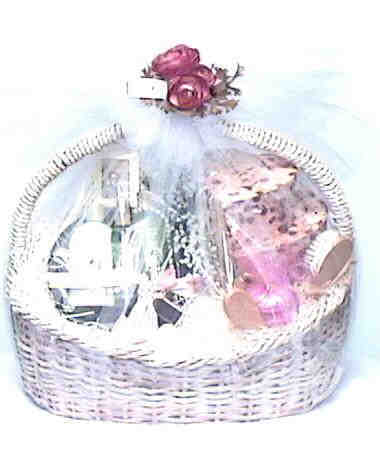 Basket Measurement 18" X 18" X 20"
Royal Wedding Gift Basket is crowned with an elaborate bouquet topping and contains a designer collection spa, body and beauty products and personal care accessories. Items include, massage oil, body lotion, fine soaps, bath crystals, wooden body massager, candles, candle holders, bath sponge, loofah brush, potpourri, milk bath, body splash, foam bath, incense and accessories such as satin clothes hangers. A complimentary gift card is included with your basket. What else is in the basket? Basket measurement 18 wide" X 20 high"
Royal Holiday Gift Basket includes a variety of mouth watering Gourmet Food Gift items, such as buttery creme cookies, real cinnamon sticks, pretzels, hard candy, English tea, a baking mold to bake your own cookies as well as other fine confections and delicious baked snacks that are available fresh. What else is in the basket? It is decorated with a miniature scene that looks like the Northern Shore, with a grassy coastline, house, landscaping, lighthouse and a sailboat. The finished basket is wrapped in cellophane and topped with a hearty bow topping. A complimentary gift card is included with your basket. Gourmet Pasta Lovers basket is healthy and delicious, includes a variety of authentic imported Italian pastas, marinara sauce, caesar dressing and gourmet café and fine decadent gourmet chocolate. Although only a few food packages are shown in this picture the finished pasta lovers basket has several more packages including more pasta and sauces. What else is in the basket? This gift basket features a shoreline scene in miniature with lighthouse, sailboat, a mansion and trees on a grass covered bluff overlooking the ocean. The finished basket is wrapped in cellophane and topped with an elaborate bow. A complimentary gift card is included with your basket. Royal Victorian Winter Wonderland Basket features a miniature winter scene complete with miniature pine trees and Victorian theme building. The snow covering sparkles with its own battery operated twinkly lights. It features a Victorian Santa Claus. and Victorian Fairies. This basket is filled with Spa and body gifts. 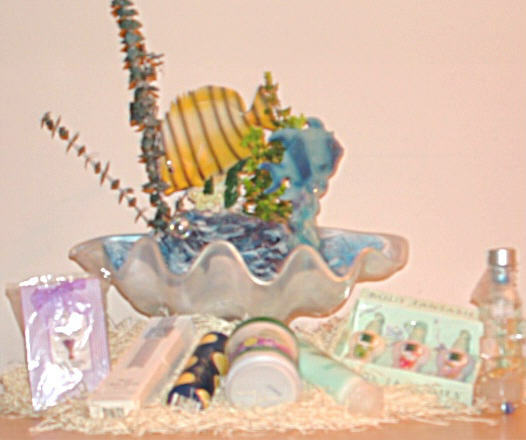 Items include, massage oil, body lotion, fine soaps, bath crystals, wooden body massager, candles, candle holders, bath sponge, loofah brush, potpourri, milk bath, body splash, foam bath, incense and accessories such as satin clothes hangers Basket is wrapped in clear cellophane and crowned with a luxurious topping of bows and silk foliage. What else is in the basket? 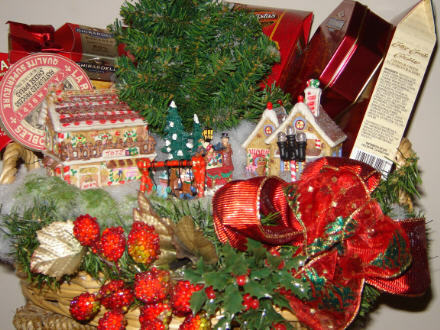 Royal Winter Wonderland Basket features a miniature winter scene complete with miniature pine trees and houses. The snow covered village sparkles with its own battery operated twinkly lights. This basket is filled with Gourmet food gifts including Cookies or other baked goodies, Gourmet Chocolate, Chocolate Covered Pretzels, Gourmet Coffee, Candy Canes, Caramel Popcorn and Shortbread. Basket is wrapped in clear cellophane and crowned with a luxurious topping of bows and silk foliage. We reserve the right to include a variety of gourmet food items of equal or greater value as available. **Please note this basket has highly seasonal items that may not be available every season. We reserve the right to substitute a comparable themed item than the ones shown here. What else is in the basket? A complimentary gift card is included with your basket. Basket measurement 18" wide X 20" high"
Royal Baby Gift Basket perfect for Baby Showers filled with items for newborn baby girls or boys. Comes in a gift basket decorate like a baby's crib and includes a small wicker baby carriage with a plush toy. Highly themed to include toys for the baby, socks, bottle washer, newborn plastic fork and spoon set, baby soother, bibs, bath and layette set and photo album for baby. Items based on availability, such as the lamp. We reserve the right to substitute items for a greater and equal value without compromising the integrity of the original design. That means if the fairy lamp, for instance, is not available we will replace it with another lamp of equal beauty suitable for the baby theme. You will be informed of any necessary alteration to this design and have the right to cancel your order prior to shipment. Royal Gift Basket unique spa and gourmet gift baskets beautifully decorated and highly themed for all occasions and people, even pets. Please inquire about custom designs for your special occasion or person. If you purchase a gift basket enter the information for your gift card here and click submit. Please personalize the basket here. If you purchase a gift basket enter the information for your gift card here and click submit. Please personalize the basket here. If you purchase a gift basket enter the information for your gift card here as well and click submit.